I've scoured the web to bring you a few ideas for holiday gifts that will endear you to the Victorianist in your life (or make nice little presents for yourself). Have you spotted an item that would make a great gift for someone interested in Victorian Britain? Let me know by making a comment to this post. 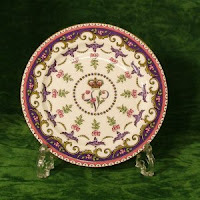 You can read "Great Gifts for Victorianists, Part II" here and "Part III" here. 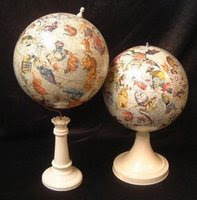 First up, this very cool globe from Greaves & Thomas, which superimposes characters from Lewis Carroll's Alice in Wonderland onto a map of the constellations. It comes in a 33" hand-colored version or a much less expensive 12" version. The image here doesn't really do it justice, so click on the link and prepare to be amazed. The V&A Shop carries an unusual selection of house and garden tools dressed up in William Morris prints, including hand trowels, secateurs, and cultivators in "Anemone" and hammers, pliers, and screwdrivers in "Daisy." Not a DIY-er? The shop also carries Morris-print notebooks, coasters, and scarves; books on Victorian design and decorative arts; Voysey tea towels; a limited edition vase based on a design by William De Morgan; a replica of a Leeds creamware mug originally created to commemorate the Great Exhibition in 1851; a silk replica of a handkerchief designed for Queen Victoria's coronation, and much, much more. 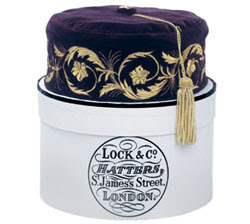 Your favorite Victorian novelist may have worn an embroidered smoking cap just like this one, from James Lock & Co., hatters to the Royal Family. Sure to lend a bohemian air to your evenings at home! 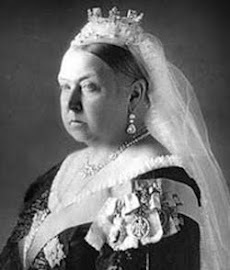 The Historic Royal Palaces online shop offers 21 items related to the Victorian period, including doll clothing, books, enamel boxes, jewelry, handkerchiefs, bookmarks, tankards and flasks, and tea paraphernalia. 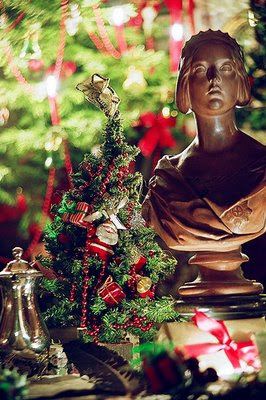 From the online gift shop of Balmoral Castle, one of Victoria's favorite retreats, comes a fabric Christmas tree ornament, a miniature plate (shown here) inspired by English fine bone china commissioned by the queen for the Great Exhibition of 1851, and cuff links that entwine the initials of Victoria and Albert. I've been a collector of Pot Belly Historical Miniature Boxes by Harmony Ball for a few years now; several of these small figurines depict Victorian personalities, including Queen Victoria, Charles Darwin, Charles Dickens (shown here), Oscar Wilde, and Robert Louis Stevenson. Their little heads pop off so you can store tiny treasures inside. The best gift of all: Consider becoming a member or making a donation to one of the following organizations that support the preservation of the Victorian past: The National Trust, The William Morris Society, Leighton House Museum, or The Victorian Society. Shown at top: a Victorian Christmas tableau at Dennis Severs' House, 18 Folgate Street, London. Do check out the home section of J Peterman. There are some wonderful items there that seem relevant to your list. Great suggestion, thanks! 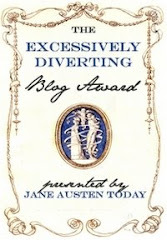 I've included a link to it on "Great Gifts for Victorianists, Part III."